I’ve been waiting for quite a wee while in a library queue to get my hands on Louise Penny’s new book Glass Houses, and it was worth the wait as it was another enjoyable trip to Quebec and the loveable village of Three Pines in particular. Armande Gamache had of course retired to the quaint and friendly village (despite the previous murders) it’s now home to him and his wife Reine-Marie. But he’s back at work now and having to testify in court in a homicide case where he was the arresting officer. It’s July and the heat is unbearable, especially for the judge and lawyers in their gowns and wigs. Everyone is fanning themselves with paper in a vain effort to get a waft of cool air, this part reminded me very much of the court case in To Kill a Mockingbird. But the incidents that led to the court case took place in the freezing Quebec winter, and through the case we’re taken back to that time. Gamache has had some very difficult decisions to make, going against everything he has been taught about being a good Surete officer. There’s a massive drug ring bringing opioids through Canada and into the US and on top of that there’s been a murder in Three Pines. It’s all very topical as opioids have in recent years caused havoc in the US but for me the murder/mystery aspect of this series isn’t necessarily the most important part. The close knit community of the villagers of Three Pines and their activities mean that reading these books is like being in the company of good friends. Everybody should have a Ruth and Rosa in their lives. I’m left wondering if in Canada the word ‘ashes’ is used to denote a sneeze. I know that in Germany they say/write ‘atchi’ or hatchi’ for a sneeze, but ‘ashes’ seems strange to me. Can anyone enlighten me? If you read this book make sure that you don’t skip the Author’s Note at the end where Louise Penny explains that her writing and Three Pines and its inhabitants helped her as her husband’s life was coming to an end, he had had dementia. It’s very moving. A Great Reckoning by Louise Penny is the latest in her Three Pines series and if you decide to start reading the series then make sure you start at the beginning and read them in order for maximum enjoyment. I’ve come to realise that although I ‘ve enjoyed them all my pleasure in them depends on how much the inhabitants of the village of Three Pines feature in the storyline, the more the merrier as far as I’m concerned. There’s a mystery involving an old map that has been discovered in the bistro. It’s very strange because the Quebecois village is unusual in that for some reason it appears on no modern maps and has no mobile phone signal, so it must feel a bit like it has fallen off the edge of the word in some ways. But it’s the place that former Chief Inspector Armand Gamache and his wife Reine-Marie have come to love, so much so that they have bought a house there. Previous investigations have left Gamache damaged both physically and mentally, but he isn’t quite ready to retire from public service yet and after pondering over several job offers he has chosen to be the new commander of the Surete Academy. In recent years that training college has become corrupt and the young recruits are being taught that brutality is normal and that they are above the law. Gamache is determined to clean the place up but he makes some surprising decisions as to which teachers to get rid of and who to hang on to. Has Gamache bitten off more than he can chew? This is a cracking read. The story involves village men – boys really who went off to fight during the First World War and who got caught up in the horror that was the Somme. This year – 2016 is of course the centenary of those battles and I’m sure that Louise Penny wrote this book in remembrance of the many Canadians who died there. 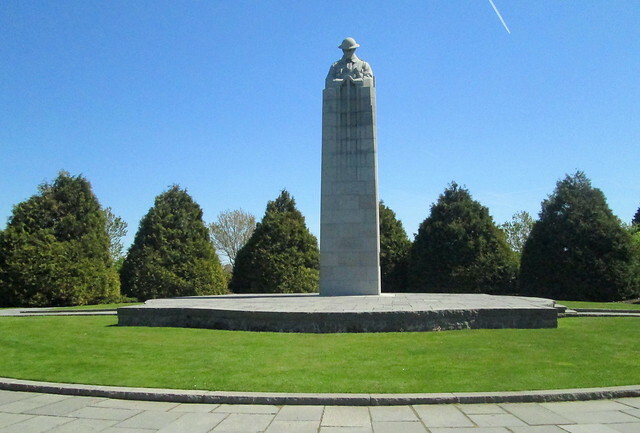 We were in Ypres earlier this year and photographed the massive but very moving memorial to the Canadians there, see the photo below. Well, I can hardly believe it but I’ve managed to catch up with Louise Penny’s Armand Gamache series. 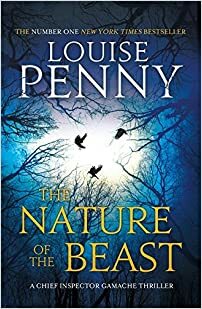 The Nature of the Beast is her latest and it’s set in Three Pines, that seemingly idyllic location which is actually quite dangerous to live in – given the murder count over recent years. Armand Gamache and his wife Reine-Marie have retired and have chosen to settle in Three Pines. They are well known in the village and in turn they know the villagers well, so when a wee boy known for his wild imagination and tall tales rushes around shouting about a huge gun and a monster in the woodland surrounding Three Pines, nobody is particularly bothered, it’s just what he does. So everybody ignores him, and that’s something that they live to regret. I really enjoyed this book although it is quite a bit darker and more unsettling in atmosphere than I usually go for. In fact at one point I did think that the plot was maybe just a wee bit far-fetched, so I was completely flabbergasted to read in the author’s note at the end of the book that it was based on truth, with Gerald Bull being a real person, who was involved in weapons design and was happy to design and build weapons for anyone who would pay him. He designed Project Babylon for Saddam Hussein. I certainly didn’t hear anything about it in the news at the time. But if you’re interested you can read a New York Times article from 1990 about it here. I hardly dare say it, but today it didn’t rain and there was this strange yellow orb hanging in the sky. No doubt it was just an aberration and normal services will return soon – rain and storms are forecast for later in the week again. Very depressing, but I mustn’t grumble as at least we aren’t living in any of the many flooded areas of Scotland and northern England. You can read about storm Desmond here. We had intended going down to Dumfries and Carlisle for a few days before Christmas too, thank goodness I suffer from terminal procrastination otherwise we would probably have been caught up in it all. At least I’ve been getting plenty of reading done. In the Guardian Review section this week there’s an article you might be interested in if you are into Jane Austen. Is anyone not a fan? – I ask myself. You can read How Jane Austen’s Emma changed the shape of fiction by John Mullan here. I’ve finished Go Set a Watchman which I swithered about reading but I really enjoyed and have plenty to say about it, soon I hope. I’m annoyed about the Louise Penny book because it’s one which I somehow missed when I was working my way through the Three Pines series, so it’ll be all out of whack! 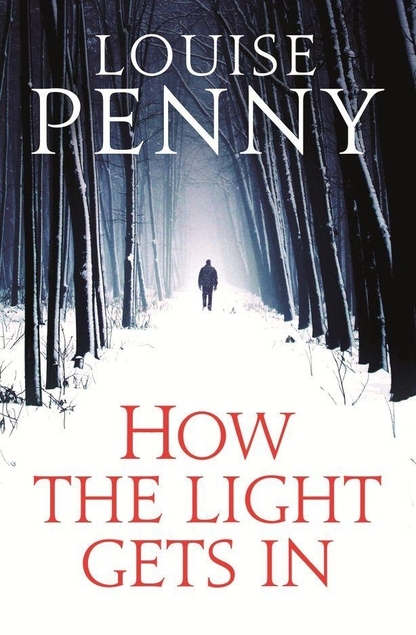 How the Light Gets In by Louise Penny was published in 2013. It’s the ninth book in a series featuring Chief Inspector Armande Gamache of the Surete of Quebec. When I got to the end of it I thought it might be the last in the series but thankfully another couple have been written since this one. I can’t say too much about this book because I don’t want to spoil it for anyone. The words ‘just brilliant’ are what come to mind – or ‘pure dead brilliant’ in Glaswegian. It isn’t a cosy comfort read in fact it’s quite stressful as just about everyone in the Surete seems to be against Gamache. Henri his German Shepherd dog is keeping him sane it seems. I’ve been catching up with this series after getting to it late, it was Joan of Planet Joan who recommended the books to me as a great read – how right she was. In fact I think I will be reading the books again eventually, just to get my fix of the village and its weird but somehow very human inhabitants. 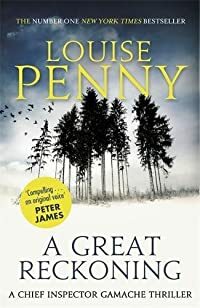 Louise Penny also chose to make her detective a decent chap who is very happily married, such a nice change from the usual cliche of a dysfunctional anti-social divorcee which so many other authors seem to prefer. But it’s not just the characters and the setting which are so addictive, it’s also the twists and turns in the plot. What a page turner! The Beautiful Mystery by Louise Penny was first published in 2012. Unusually this one has nothing to do with the attractively dangerous village of Three Pines in Quebec. The setting is a remote Gilbertine monastery in the wilds of Quebec. The monastery has been there for hundreds of years, with just 24 monks in residence at any time as the environment couldn’t sustain any more people. The monastery had originally been set up by monks who had been fleeing the Inquisition but they had always been great singers and Gregorian chants had become almost a religion in themselves. Bizarrely they had had a hit with a record and had made lots of money which had been used to renovate the monastery which had been very basic, with nothing in the way of heating, making life there in the winter very difficult. But all was not well within the community and murder was committed which is why Armande Gamache and his trusty assistant Jean Guy Beauvoir have been summoned to the remote monastery which is in the middle of a large lake. Nobody other than the monks ever gains entrance to the place and the boatman who ferries them there is confident that he’ll only have to wait a few minutes for them before they end up back at his boat for the return journey. So he’s amazed when they disappear into the building. There are 23 monks in the monastery and one of them is a murderer. Of course Gamache and Beauvoir get to the bottom of it but Beauvoir is still fragile mentally after a previous case went disastrously wrong and it all comes back to haunt him in this one. Gamache has known for a while that someone within his own force is out to get him and it becomes a wee bit clearer who it is in this book. I did find some bits of it quite predictable though. Top marks to Penny though for her nod to Monty Python – Nobody expects the Inquisition. Despite the setting I still enjoyed this one, maybe just not as much as the Three Pines books. If you’re going to read them be sure that you start at the beginning, reading them all in order to get the most from them. I was really annoyed with myself because by mistake I read these two Louise Penny books out of order, but in the end it didn’t really spoil things for me. Bury your Dead was published in 2010. The setting is mainly Quebec City although it does switch to Three Pines occasionally when Beauvoir is sent there by Gamache to do a bit of sleuthing. A man is murdered in the basement of the library which is a focal point for the English speaking inhabitants of Quebec. It turns out that the body is that of a famously obsessed man who has been searching for the body of the man who founded Quebec. This one doesn’t rank amongst my favourites of the Gamache series, mainly because I found the rivalry or should I say prejudice between the French Quebecois and the Anglos to be a bit depressing. Also I found it to be too sad, with one of the young members of Gamache’s team not surviving. I know, that’s silly of me as it is FICTION after all. I enjoyed A Trick of the Light much more, it was published in 2011. Everything is going well for Three Pines inhabitant the artist Clara Morrow, at last her dream has come true and her work is receiving the recognition that it deserves. But everything starts to go wrong on her big day and it only gets worse the day after when a body is found in her garden, where only hours before everyone had been celebrating Clara’s success. A Trick of the Light is about the nasty business of the art world and also the stresses of marriage when jealousy and fear cause one spouse to do their best to scupper the career of their partner. I just love the way Louise Penny’s characters are developing. The more I find out about their back stories the better it gets. The Brutal Telling by Louise Penny is the fifth book in her Armand Gamache/Three Pines series, and I think that this one is the best yet. I thought it was a cracker, I don’t know if that is because I had lots of time for reading so I was able to read it in about three sittings, despite the fact that I’m really not a fast reader as I don’t skim read. Or maybe this really is the best so far. I was just beginning to think that Three Pines is the Quebec equivalent of Midsomer Murders when one of the characters – Clara says: Every Quebec village has a vocation. Some make cheese, some wine, some pots. We produce bodies. So, Three Pines is beginning to feel like a home from home for Chief Inspector Gamache. It should be a nightmare of a place to live in but the community is so close and the inhabitants so quirky and flawed that it feels like real life, after all, nobody is perfect. I can’t say too much about the story because I don’t want to spoil it for any possible readers. Suffice to say that the body of a tramp is found in the bistro, he’s a complete stranger to everyone and Gamache has the job of finding out who he is and why he has been murdered and put into the bistro overnight. The lives of all the locals are turned upside down as the police search everywhere for clues. The loyalties of the locals are pushed to the edge. Ruth Zardo, the elderly poet who is rude and foul-mouthed to everyone, and who is accompanied everywhere by Rosa her pet duck, proves herself to be the opposite of the personality which she works so hard to project. 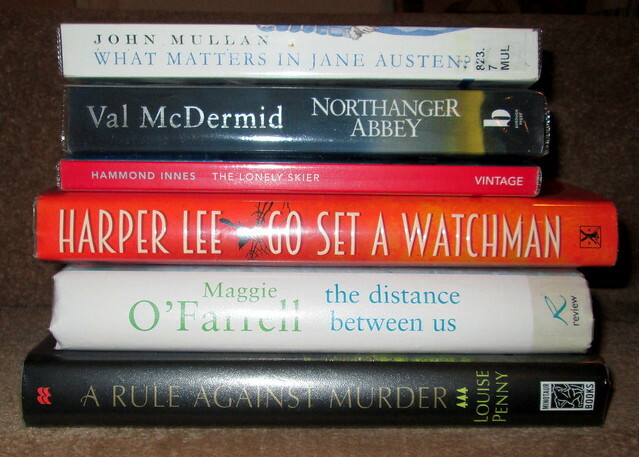 I’m so glad that I took the time to request these books in order from the library as the lives of the characters unfold bit by bit and there’s always something new to find out about them. The Murder Stone by Louise Penny is the fourth book in the Chief Inspector Gamache series and I’m so glad that I decided to read them all in order as the relationships between Gamache and his detective colleagues are developing nicely. The Quebec village of Three Pines plays hardly any part in this book although Reine-Marie Gamache does stay there in the B&B whilst her husband solves the murder which has taken place when they were on their annual visit to the auberge which they had visited over 30 years ago for the first time. The Manoir Bellechasse is one of the finest auberges in Quebec and the Finney family has also checked in, they consist of an elderly mother with her four middle aged children, their spouses and Mrs Finney’s second husband. They use the auberge for their annual reunion and this time around it’s a bit different as a huge statue of Mrs Finney’s first husband is being unveilled in the grounds of the auberge. It’s not something which the owner of the hotel particularly wants in the grounds but a large amount of money has been paid to her to accomodate the statue. The Finney/Morrow family is a poisonous one with even the mother being cruel and vindictive, they all look down their noses at other people, particularly the Gamaches who they have decided are too common for the hotel. They all have long memories and take particular joy in hurting each other psycholgically. When a murder is committed there’s a plethora of suspects for Gamache to question.